The Gateway premium, padded, sliding transfer bench and bath/shower chair is the perfect bathroom aid for individuals with decreased and/or painful mobility challenges. It is the only transfer bench designed to eliminate both falls and skin tears. In addition, the swivel seat eliminates the need for the device to protrude inconveniently into the bathroom like many old-style, non-swiveling models. The Gateway is the only transfer bench that incorporates a padded seat base and backrest for the ultimate in safety and comfort. The soft padding prevents skin tears and feels much warmer to the skin than standard hard plastic models. In addition it helps prevents slips and falls. All surfaces are easy to clean and disinfect. The quick, tool-less assembly and height adjustment feature allows the Gateway to integrate perfectly with virtually every tub on the market. The frame is constructed of rustproof aluminum for years of reliable use. Designed by front-line healthcare workers with decades of experience in safe bathing and transfers, the Gateway is considered the best-in-class transfer bench/bath/shower chair product by nurses, physiotherapists and doctors across the country. Seat Belt is included. 330lb Weight Capacity. 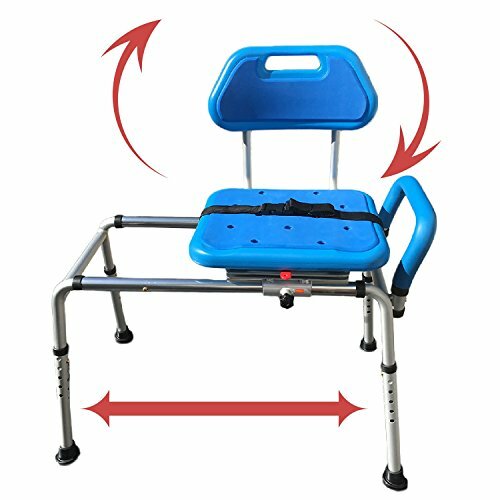 PROFESSIONAL GRADE sliding transfer bench, bath and shower chair. Effortless sliding and pivoting for safe, easy transfers in and out of the tub. Platinum Health products are used in thousands of hospitals, nursing homes and in private homes by customers who value quality, safety, convenience and comfort over price. Quick TOOLS-LESS assembly in less than 5 minutes. PADDED SEAT AND BACKREST. No more cold, slippery, hard plastic surfaces like old-style bath chairs; the Gateway provides warm to the touch, comfortable, slip resistant padding on both the seat and backrest. The medical-grade, closed-cell molded polyurethane padding will not absorb any water and is easy to clean and disinfect. Seat rotates 360 degrees for easy integration with all tub/shower entry configurations. Seat locks/unlocks every 90 degrees. SWIVEL-SEAT SPACE SAVING DESIGN. Not only is the swivel seat safer, easier to use and more comfortable than a standard fixed seat, this design means that the chair protrudes into the room much less than a traditional transfer bench. More convenient for the user, and more convenient for others that don't require use of the chair since the free space in the bathroom is much greater. PADDED ASSIST HANDLE helps users easily glide in and out of the shower or tub. The smooth gliding chair eliminates the dangerous need to shuffle across the bench like old style bath benches that can often lead to skin tears, knee and hip joint strain as well as falls. HI CONTRAST COLOR FOR SAFETY. Our unique HI-VIEW BLUE color makes the key parts of the chair much easier to see by vision impaired and/or dementia afflicted users. Rather than blending in with the background like old-style white benches, the blue contrast color helps users distinguish the chair from its surroundings and significantly reduces slips, trips and falls- the leading cause of death by injury in people over 65.